Northern Ireland athlete Amy Foster has been included in the initial Ireland team for next month's European Indoor Championships in Gothenburg. 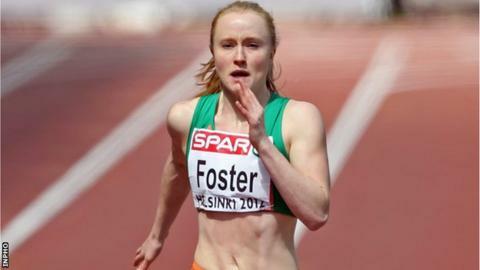 Sprinter Foster secured her place by running a personal best of 7.33 seconds for the 60m at last weekend's Irish Indoor Championships in Athlone. Stephen Scullion must wait to see whether he will be selected. Scullion also achieved the 3000m qualifying mark in Birmingham, but his place is not guaranteed. Four Irish runners have bettered the standard in his event and Ciaran O'Lionaird has apparently indicated that he wants to run the 3000m in Gothenburg as opposed to the 1500m. David McCarthy has also been picked for the 3000m having run a personal best of 7:51 in Boston over the weekend. Scullion clocked 7:58.11 in Birmingham with Donore athlete John Travers also inside the European Indoor standard as he won the Irish title in Athlone in a time of 7:58.55. With other athletes also close to achieving the qualifying mark, Athletics Ireland has opted not to confirm the third 3000m place until next Sunday. Travers has also achieved the 1500m standard for the Gothenburg championships. Brian Gregan (400m), Derval O'Rourke (60m hurdles), Fionnuala Britton (3000m), Ciara Everard (800m) and Tori Pena (pole vault) join O'Lionaird, Foster and McCarthy in being selected for the championships. Letterkenny athlete Mark English has opted to decline the offer of a place in Gothenburg despite achieving the 800m qualifying standard in Athlone on Sunday. English is focusing his attentions on preparing for the European Under-23 Outdoor Championships this season and also securing a place at the World Championships in Moscow. Gregan, O'Rourke, O'Lionaird and Britton all look capable of challenging for medals in Sweden.